With 2:16 left in the game Jaquez Johnson and the offense took the field for another potential game winning drive. Just like the game against UTSA, FAU delivered as Johnson connected with Lucky Whitehead on a bubble screen for the game winning 64 yard pass and catch touchdown as FAU beat WKU 45-38 to go to 3-4, 2-1 on the year. 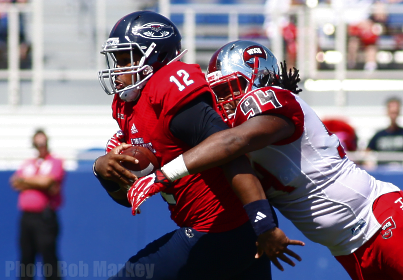 FAU outscored WKU 31-7 in the second half with Johnson (pictured above) leading the way for the offense. Johnson finished the game with a gaudy stat line going 23-34 for 325 yards and three passing touchdown, while rushing the ball 17 times for 96 yards and two touchdowns. "The bye week really helped with my injury," said Johnson who missed a game with a shoulder injury. Charlie Partridge stressed over the bye week that the players and coaching staff would make the necessary adjustments that plagued the team leading up to today’s game. At halftime it seemed those adjustments had went on deaf ears, as the Owls trailled Western Kentucky 31-14 but the team was never worried. The defense spurred the comeback for the Owls. At halftime Western Kentucky gained 303 total yards on offense and was 2-5 on third downs with one turnover. In the second half WKU had 99 total yards, went 3-7 on third downs and a turnover on their final possession. WKU had the ball with less than 90 seconds to tie the game before Trey Hendrickson’s strip sack of Brandon Doughty. “On the sideline I said Trey you faced a lot of adversity this season. It’s time for you to make a play,” said Coley. “I seen the quarterback flushing out, Trey’s coming from the backside and I knew the ball was coming out,” said Coley on the turnover to win the game. WKU’s final three drives were punt, punt, and fumble. FAU got off to a slow start with the noon kickoff as the Hilltoppers caught the Owls sleeping and used some trickery, a flea-flicker, to score the game’s first touchdown as Florida natives Brandon Doughty Taywan Taylor for a 50 yard touchdown pass. Doughty then found another Florida native Willie McNeal for a 30 yard touchdown pass. In the game’s first five minutes FAU trailed 14 points. The Owls started the game on offense with a three and out and a punt. “Offense needs to come out and stop stalling like we have been,” said Johnson on the team’s slow start. The offense began to pick up momentum once freshman running Greg Howell started getting carries. Howell finished the game with 18 carries for 118 yards and one touchdown in his first career game. “He always gave us a great look as a scout,” said Andre Kirk. "Effort," said D'Joun Smith on the team's comeback performance. "They can never question our effort."